The local bookstore, Bookends, in a picturesque suburb of New York City, Ridgewood, NJ is frequently a pit stop for many a famous author, including celebrities, reality stars, athletes, musicians and rock stars. For someone interested in politics like myself, former leaders of the free world are my rock stars. 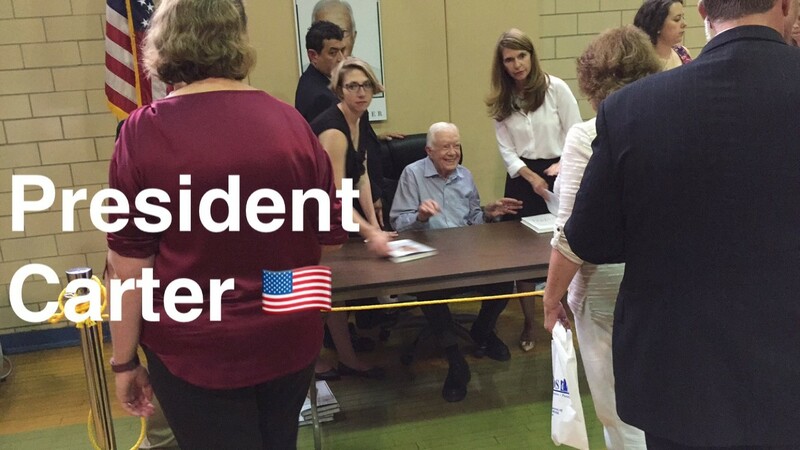 When I got the email about two months prior to the date that President Jimmy Carter was coming to the store to sign copies of his book, "A Full Life, Reflections at Ninety", I bought my book and invited my son. Being 90, in the back of my head, I thought, I hope nothing happens to him so we get to see him. Well, I think I was one of the fortunate ones as shortly after this stop he announced he had cancer. If there were more dates, that book tour is on hold now as he focuses on treatment, so the trip to see him became even more special for me. The line in the building they held it in, the local YMCA - because the bookstore was too small - accommodated the 800-1000 people that came to see him. 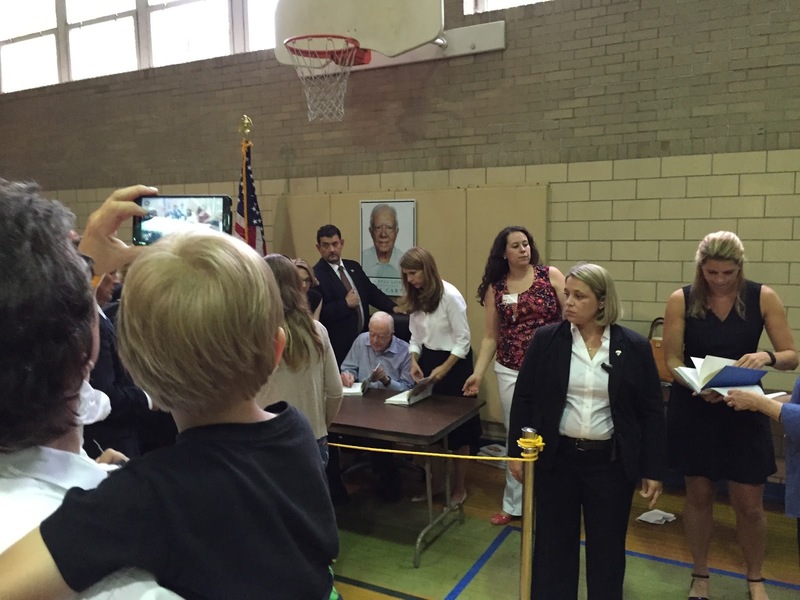 The ticket process was rather good, though many people had to walk back to their cars because only a camera, the book, and keys basically were permitted in the room with him. Secret service carefully scanned everyone.Local police also were present. Though we were shuffled from one room to another, it was orderly. People online were reading the book as they meandered left and right through the teller-like lines set up. 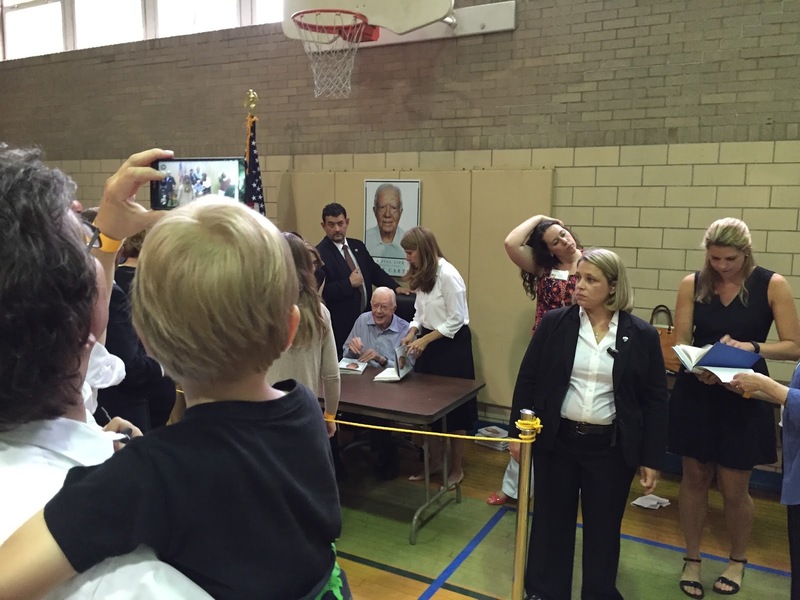 People were of all ages, young and old, with many parents bringing young children. Once we got to the gym, where he was situated, you could feel the excitement in the air. "Leader of the Free World", and "in the presence of greatness", those are the words one heard echoed throughout the room because indeed that is what he was and what we were. Larger than life. 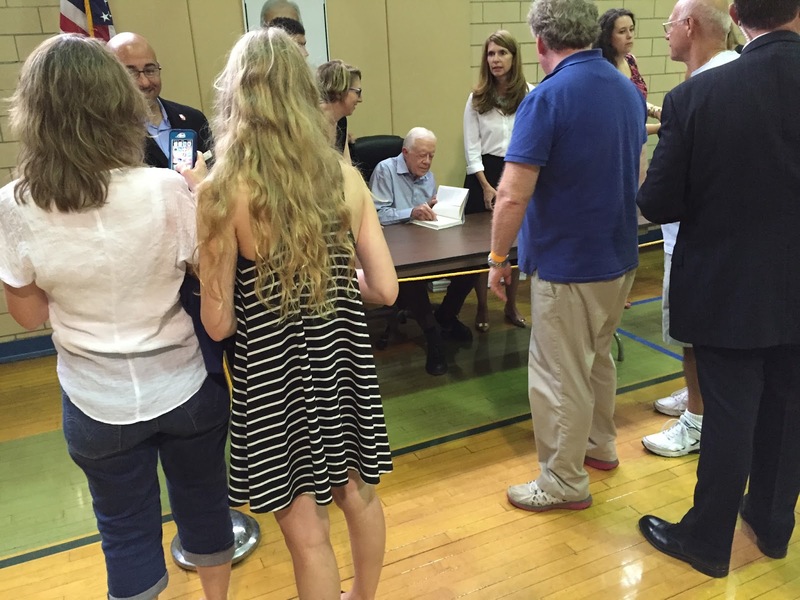 President Carter was sitting down autographing each book. He was not shaking hands or speaking to anyone, perhaps other than a hello, and there were guards within arm's reach of him. Everything was organized and everyone got a few seconds (and a few photos) of the man that once ruled the free world and since has devoted much of his life to his humanitarian foundation, The Carter Center. Visit www.TheCarterCenter.org. for more info. Hearing his diagnosis now, one knows that the cancer was in his body as he courageously, quietly and steadfastly fulfilled his book tour commitments. That just goes hand in hand with this man that spent his life in service to our country and humanity.